I was just thinking about how lucky I am to have two of the most awesome guys in my life. They do little things that always show me how much they care. 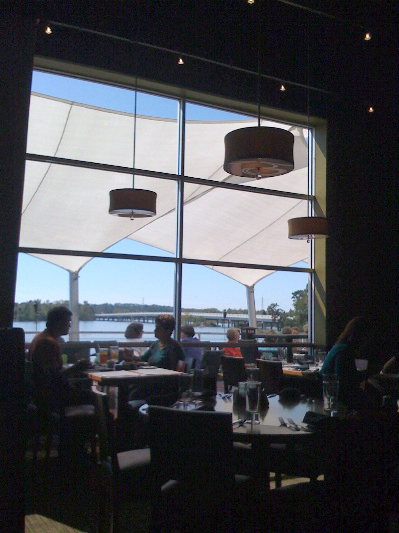 My husband treated me to an unexpected lunch at a nice restaurant by the river a couple of days ago. I think it was his way to offer some relief from a tough week. It was nice to have some time together—alone. He's been nothing but supportive about all the craziness that I go through. A quick shot with my iPhone. Restaurant by the river. South American cuisine. Yum! The guys had an early soccer game on Saturday morning (Dad is the team coach). They let us girls sleep in. Just before they left, I felt my D pull the covers over my foot, which was sticking out from under the covers, he gave me a gentle pat on the head and a kiss on the cheek. The whole time he assumed I was fast asleep. It's not the first time I get 'tucked in' by my eight year old. It makes me smile every time. We're enjoying a beautiful Sunday. I hope you are too. That is so adorable!! What a wonderful family! What a lovely post. You are blessed. I am sorry to hear about your neighbor- how difficult a situation. Sending my best and keeping them in my thoughts.